Architecture critic Alex Bozikovic of The Globe and Mail once called One Spadina, the central hub for the John H. Daniels Faculty of Architecture, Landscape, and Design, “one of the best Canadian buildings of the past decade.” But since the faculty celebrated its formal opening in November 2017, graduate students have been voicing complaints about the building’s design. Specifically, the graduate studio space in One Spadina has come under fire for its limited desk space and bad acoustics. The New York Times once praised the studio as a “110-foot-wide column-free room,” but the lack of columns and walls, paired with its high ceiling, have created an environment where hushed conversations and even clicks of keyboard typing echo across the room. In addition to the high noise levels, there is also limited desk space and privacy in the studio, due to desks lacking dividers and the absence of walls. In response to the lack of privacy, many students have resorted to constructing their own dividers as a solution. However, there are no tools available for graduate students to construct these dividers, said Nassim Abdollahi Sani, a second-year Master of Architecture student. Furthermore, the time for construction is too costly, especially for students inexperienced with woodwork. “I feel like for someone who is here maybe two, three days a week, four days a week for a short time, it doesn’t make sense,” said Sani. The noise levels are a partial result of having no dividers on the open desks. The undivided desk surfaces have also resulted in no privacy and unclear boundaries of space, explained Sani. Sani recalled that in the old building for the graduate studio spaces, students were assigned cubicles with tall walls for privacy. “I’m not sure the real evidence exists to say that they’re working here less than they were before,” Sommer said. Suggesting solutions to the problems of acoustics and privacy, Sommer recommended students go to the libraries, fabrication labs, and the main hall. 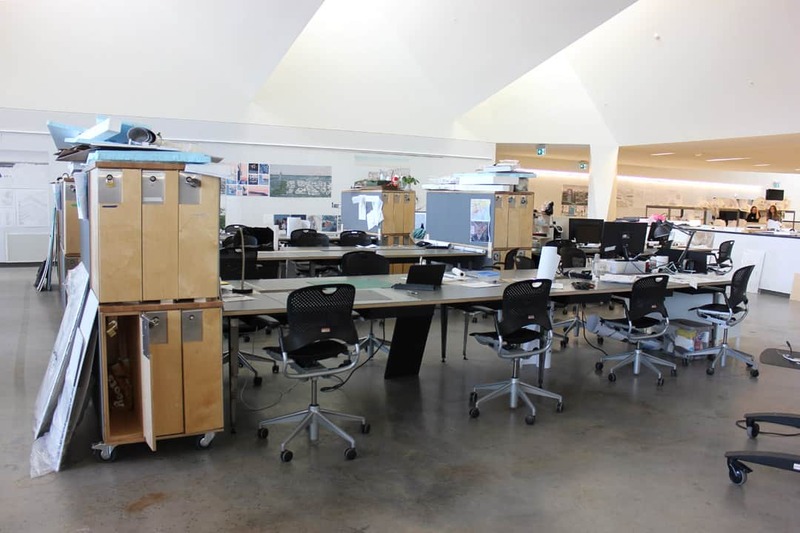 While all three graduate students interviewed in the open studio spaces preferred the collaborative environment more than the previous individual environment, they still believe that the space could be improved. “The problem with that was how it was a smaller room, with a lower ceiling. It just felt like an office,” Sani added. Editor’s Note (November 1, 11:02 pm): This article has been updated to correct a mistake made in the editing process that misattributed a quote to Sommer.